The fruit banana which is easily found in Sarawak are packed with plenty of nutrients and comes with a strong rich taste. It is no wonder bananas have been incorporated in Sarawak’s desserts list. From eating it as a fruit on its own, to fried banana fritters, banana splits, banana shakes, banana bread and banana cakes! The health benefits are internationally renowned and even more as a famous dessert. With all that goodness packed into what we call the Banana Cake, we can receive all that this tropical fruit has to offer through our confection. Banana Cakes are not only fragrant and tasty but can be enhanced even more with some sweet icing as the top or any topping of your choice. If chocolate is what you desire, there can be chocolate icing on the cake. It is all up to individuals taste. 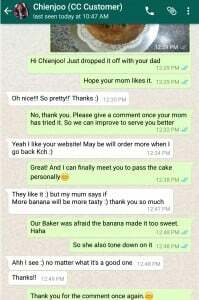 Here at the heart of Borneo, Cakes Corner have the advantage of attaining the freshest organic bananas to bake this scrumptious cake with any icing of your choosing. With creativity overflowing, on top of the icing, there can be delightful banana toppings or any other fruit to your liking. Scroll down to see more. This is where health and fun food comes together. Get your healthy banana cake now! This also applies for our other ingredients such as milk, cheese, flavorings, colorings and in this case bananas. Often commercial cake stores get their colorings from our neighbouring Indonesian suppliers. These coloring prices are more competitive but it will definitely stain the fingers and it is hard to come off, unlike the ones we use which are from America. So imagine consuming it! When it comes to milk and cheese, we all know that New Zealand has the freshest air-flown branded products there is in the market. All these is possible because of the lesser overhead cost we have. Plus in Borneo, we have fresh supplies of bananas all year round! 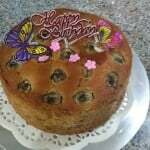 Want to learn how to bake a banana cake? Click here for our simple recipe.